I adored this book. I mean LOVE loved it. I adored Eleanor in all of her weirdness. She’s amazingly written and the prose (ie. her voice) – through her thoughts and dialogue are mind-blowingly good. This was a rare occasion on which I both did and did not want a book to end. Gail Honeyman won a number of awards in Scotland and the UK for this book, and they are most certainly well-deserved. But everything changes when Eleanor meets Raymond, the bumbling and deeply unhygienic IT guy from her office. When she and Raymond together save Sammy, an elderly gentleman who has fallen on the sidewalk, the three become the kinds of friends who rescue one another from the lives of isolation they have each been living. And it is Raymond's big heart that will ultimately help Eleanor find the way to repair her own profoundly damaged one. This book was a huge shock to me. I grabbed it thinking I’d read a bit and continue with it over future nights but only put it aside 70% through when a new ‘section’ started and it was obvious things were taking a turn for the worse. I needed to prepare myself. I’d connected so much with Eleanor I knew whatever was coming would completely destroy me. Along with her. But… here’s a hint, the book’s first section is entitled: Good Days. And the next (when I needed to mentally prepare myself for what was coming) is titled, Bad Days. Interestingly Raymond is not the only catalyst for Eleanor Oliphant’s decision to change her life. In her mind it’s a local band ‘frontman’ Johnnie Lomond who – for reasons known only to Eleanor – takes her fancy and (despite being fairly realistic about her own looks and demeanour) decides they will become an item. She meets Raymond at the same time and the pair become friends. Of sorts. She is – however (of course) planning for her big encounter and great romance with Johnnie who could not be more different to Eleanor (and Raymond) if he was from another planet. Whether Johnnie and Raymond came along at the right time – and Eleanor was open to change – or if she was already on the precipice and they happened to be there, we’re not sure. As she puts it, she’s ‘ready to rise from the ashes and be reborn’. I would disappear into everyone acceptability. I would not be stared at. The goal, ultimately, was successful camouflage as a human woman. Indeed, I loved this book so much it’s going on my ‘best books ever’ list. I’m not entirely sure I have one but mentally I add something to my collection every so often. When reading a book for review I usually take notes re key characters, major events and things that particularly impress me or annoy me. And then I note phrases, sentences or paragraphs I particularly love in case I want to use them in a quote. Initially I suspected she was autistic (as I think women can be on the spectrum) but we learn early on Eleanor has suffered childhood trauma so I suspect some of her eccentricities were psychological (*mind creaks as I think back to my undergraduate psychology studies about PTSD, abuse and abandonment*). Certainly she’s not particularly self-aware. I loved that she’s sure everyone else is the problem, though also recognises she isn’t as socially savvy or emotionally evolved as she could be. 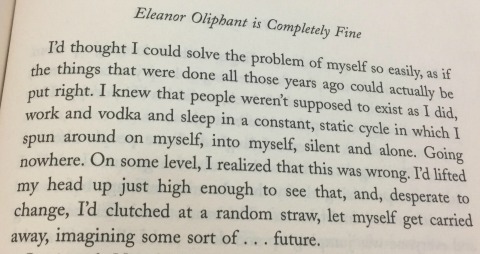 Quite frankly Eleanor Oliphant would be seriously hard work to be around and that’s obvious from the way she interacts with her colleagues and the way they speak about her when they don’t know she’s listening. But, like the difficult Britt-Marie (in Britt Marie was Here by Fredrik Backman), there’s something incredibly endearing about Eleanor. It’s not surprising that some of those she meets take her under their wing. That they see beyond the scarred exterior and grating ways into her fragile and needy heart and soul. Because, although Eleanor sets out to change the way the world perceives her (at least physically or superficially) she also changes the way she perceives the world. ‘But I don’t have any emotional needs,’ I said. Neither of us spoke for a while. Eventually, she cleared her throat. This reminded me of other books I’ve loved that have been very much character and ‘voice’ driven. Room, The Eye of the Sheep, When the Night Comes, Past the Shallows and Addition (by Toni Jordan) come to mind. Not to mention Jane Austen’s very verbose but articulate and witty prose. This book made me laugh and it made me cry; not to mention everything in between. Honeyman very slowly and deftly unwraps the past and Eleanor’s secrets. We kinda know what’s coming and would prefer to avoid it if at all possible, but also know it’s something ‘we’ (cos we’re there with Eleanor) need. 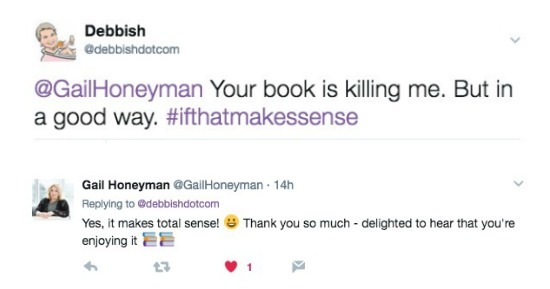 Indeed, I’ve struggled with this review, knowing it wasn’t going to be as eloquent as I’d hoped or would do the book justice. In reality I wanted to just type… YOU MUST READ THIS BOOK! and leave it at that. 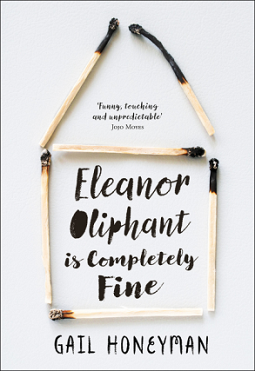 Eleanor Oliphant is Completely Fine by Gail Honeyman was published in Australia by Harper Collins and is now available. Oh, and I quite liked it… in case you were in any doubt. PS. The pics of quotes are those I tweeted / Facebooked as I was reading the book. And it was very hard to narrow down those I wanted to use!